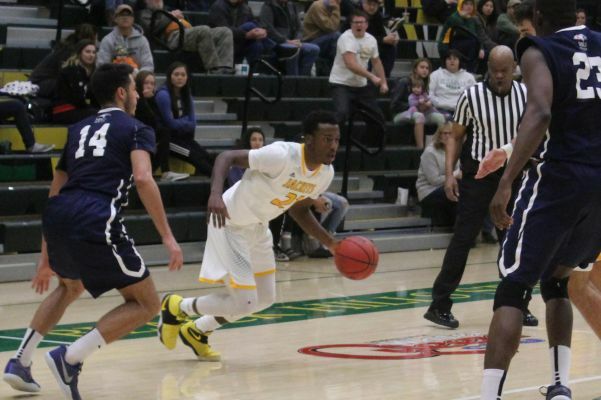 GOLDEN, Colo. – Makaleb McInnis scored in double figures, but the Black Hills State University men's basketball team fell to No. 6 Colorado School of Mines, 70-51. McInnis led the way for the Yellow Jackets (4-3, 1-2 RMAC) with 11 points, while Antonio Capley and Wyatt Krogmaneach added nine points. After Connor O'Hearn drained his second three-pointer of the game to make the score 7-6 in favor of the Orediggers (9-0, 3-0 RMAC), the home team went on a 12-0 run to take control of the game, 19-6. Mines pushed their lead out to as many as 20 in the first half, and led by 15, 37-22, at the half. Fraser Malcolm hit a trey to open the second half, but the Yellow Jackets could not get the momentum going, remaining down by double-digits for the duration of the game. The nationally ranked Orediggers earned the 19-point victory, 70-51. ?????? ?BHSU shot 33.9 percent from the field (20-for-59), while CSM was 52.0 percent from the floor (26-for-50). The Yellow Jackets were 5-for-23 (21.7 percent) from beyond the arc, while the Orediggers were 13-for-20 (65.0 percent) on three-pointers. The Green and Gold were outrebounded, 39-25. ?????? ?All-RMAC player Luke Schroepfer led all scorers with 26 points. Michael Glen had a double-double for Mines, scoring 12 points and pulling down 10 boards. The Green and Gold will look to bounce back against Colorado Christian on Saturday, December 9. The game is scheduled to begin at 7 p.m. Meanwhile, Katie Messler scored a career-high 17 points, but the Black Hills State women's basketball fell to Colorado School of Mines, 83-74, on Friday evening. The loss snapped an eight-game winning streak for the Yellow Jackets. Messler led BHSU (8-1, 2-1 RMAC) with 17 points, going 6-for-9 from the field and 5-of-6 from the free throw line. The freshman also pulled down nine rebounds in the game. Remi Wientjes added 10 points. The Yellow Jackets jumped out to a 12-4 lead, with the run beginning and ending with a Keely Bertram three-pointer. However, the Orediggers (6-3, 3-0 RMAC) fought back and took a 13-12 lead with 3:14 remaining in the first quarter, and eventually led, 20-14, at the end of the period. In the second quarter, the Green and Gold went down by nine points, before drawing even at 25-25, with 7:19 remaining in the half. Colorado School of Mines again took control of the game, and led 45-37 at halftime. The Yellow Jackets chipped away at the lead in the third quarter, eventually tying the game, 62-62, with one minute remaining in the period. For most of the fourth quarter, the game remained close, however, with the game tied, 71-71, the Orediggers went on a 12-3 run in the final 4:12, to take the victory, 83-74. BHSU shot 42.9 percent from the field (24-for-56), while CSM was 47.5 percent from the floor (29-for-61). The Yellow Jackets were 7-for-21 (33.3 percent) from beyond the arc, while the Orediggers were 10-for-20 (50.0 percent) on three-pointers. The Green and Gold were outrebounded, 36-32. BHSU had 21 turnovers, which led to 26 Mines' points. Emily Bailey finished with 23 points for the Orediggers, while Anna Kollmorgen had 14, and Cassidy Budge added 11. The Green and Gold will look to bounce back at Colorado Christian on Saturday, December 9. The RMAC match-up is scheduled to begin at 5 p.m.